Preheat the oven to 350 degrees. Line a baking tray with a silicone mat or parchment paper and set aside. In a medium bowl, whisk together the sorghum flour, baking powder, and salt. Set aside. Add the sugar and coconut oil to the bowl of a stand mixer fitted with a paddle attachment. Beat on medium high until the mixture is light and fluffy, about 2-3 minutes. Turn the mixer off and add the almond butter, vanilla, and almond extract. Beat on medium until well incorporated, scraping down the sides as needed. Add in the half of the flour mixture and beat on medium-low until there are no streaks of flour left. Add in the second half and repeat. Scrape the bowl if needed and beat again. Add in the chopped almonds and mix one last time until they are mixed through the batter. Divide the dough in half and use your hands to form it into two rectangles on the baking sheet, about 1 inch tall and 5 inches wide. Bake for 20 minutes and then remove from the oven and set aside to cool for 30 minutes. While the biscotti is cooling, reduce the oven to 300 degrees. Once the biscotti has cooled, transfer the loafs to a cutting board. 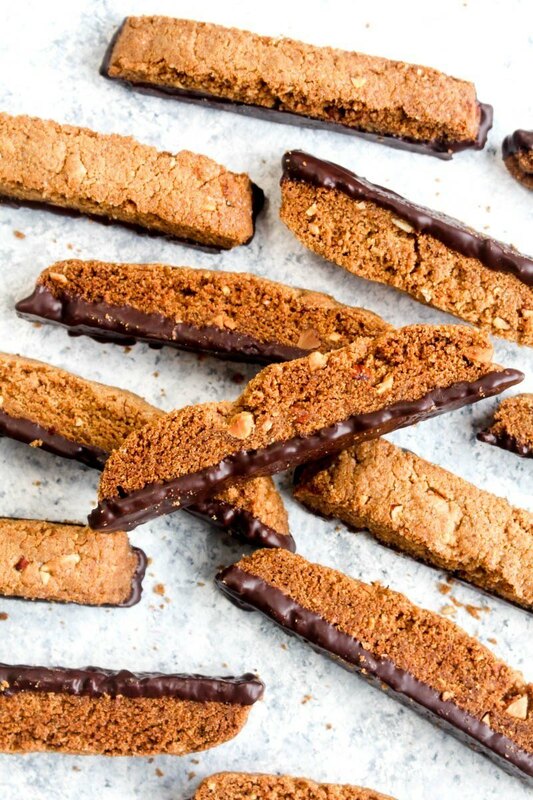 Cut the biscotti into 3/4 inch slices and place them back on the baking tray. Bake for 40 minutes or until the biscotti are golden brown. Remove from the oven and the let cookies cool on the baking sheet for 5 minutes then transfer them to a cooling rack to cool completely. Dip the bottoms in melted dark chocolate, if desired, and allow the chocolate to set before serving.